The bootleg CD Antarktis contains a crazy mixture of TD music, photographs and cover text. The music comes in a good sound quality, but the choice of music and photos puzzles the real TD experts. There are only 65 minutes of the more than 2 hour long Berlin concert, but additional music from the 1990 Bristol concert, which had already been released on the bootleg CD In den Gärten Pharaos / Bicycle Race. 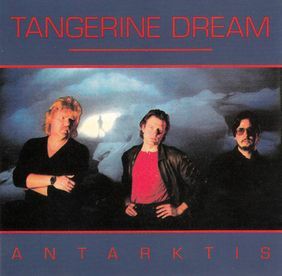 The line-up on the cover photo (that was taken from the 1982 Logos Live album) fits to the concert events like the title Antarktis to the Berlin Reichstag building. The CD has been seen with six different colour variations featuring blue, red, white, silver, gold and black CD bodies. The CD states a different reference number than the backside insert. An additional printing is stating 'For promotion only'. The track listing on the backside insert features fantasy names of the compositions. The copyright note refers to an alleged German company called 'Pinguin Tonträger'; the origin of this CD was Germany. The second part of the radio broadcast of the 1987 concert was released on the bootleg CD 20th Century Serenades a short time after. The only official release of this concert was a remixed excerpt of 27 minutes on the album Livemiles. This bootleg became obsolete due to the release of Tangerine Tree Volume 38: Berlin 1987 and Tangerine Tree Volume 70: Bristol 1990.